A variety of techniques exist for estimating parameters of the return decomposition model, previously introduced in Index Return Decomposition. 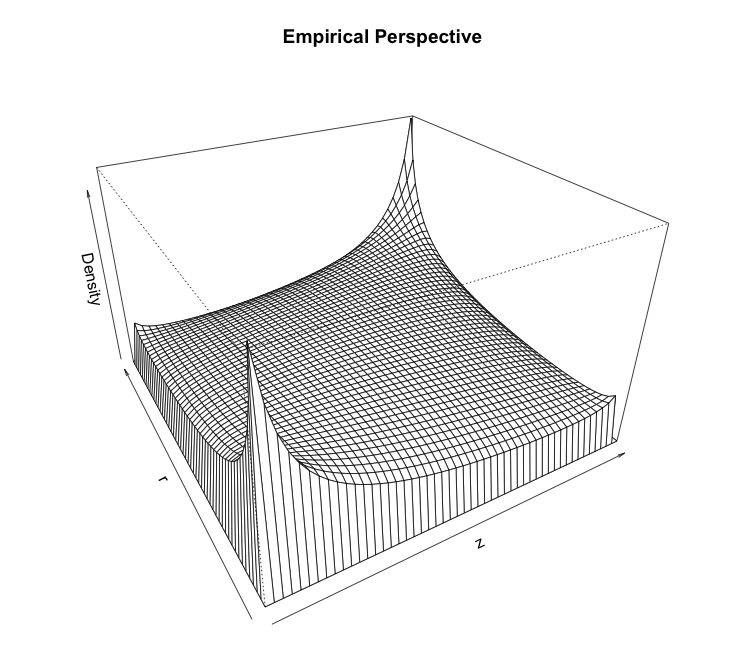 This post considers estimation of an independent mixture model via maximum likelihood (MLE), a workhorse of frequentist statistics and always a nice place to begin. This assumption permits focus on estimating , providing insight into the mixing behavior of the return being decomposed: if a stock return behaves like its index, then mixing is low with small (in the limit, when a stock behaves identical to its index, as no mixing is required); in contrast, the stock return behaves independent from its index on a regular basis, then mixing is high with a large . This optimization can be performed numerically in R via minimization using DEoptim of the negative log likelihood negLogLikeFun (negative is due to minimization in DEoptim versus maximization of ). DEoptim is chosen due to rapid convergence on non-smooth global optimizations. One interesting observation of these densities is their location parameters are on opposing side of zero: has positive location, while has negative location. One interpretation of this is positive returns from CRM disproportionately originate from the idiosyncratic , while negative returns originate from the index . Economically, this is plausible: positive news is often idiosyncratic, while negative news is often market-wide. Subsequent posts may consider alternative estimation techniques for this model. # return distributions are normal. # return distributions are skew-t.
# return distributions are skew hyperbolic student-t.
# Decompose return of two series, using several parametric distributions. hi quantivity, nice post! 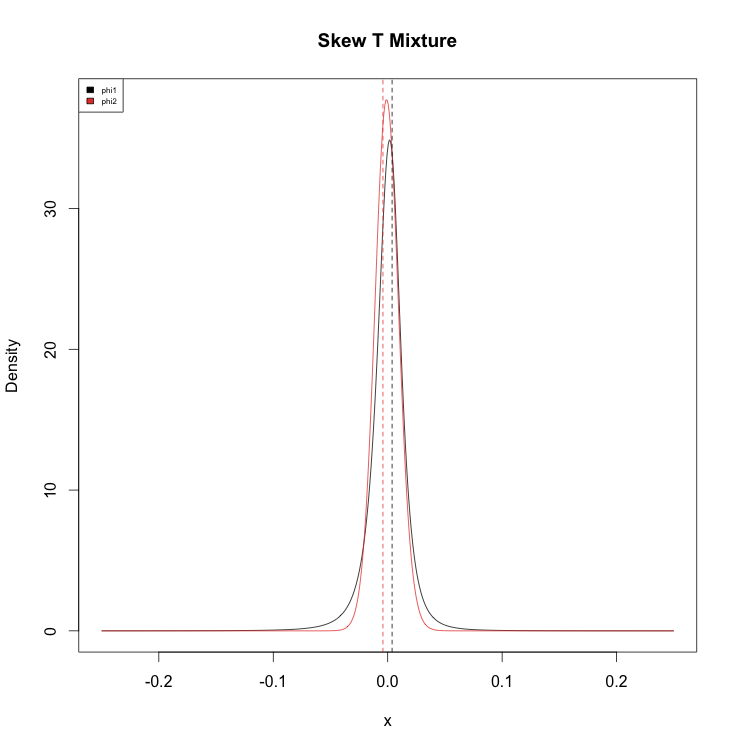 the skew-t has more parameters than the norml; did you consider the possibility of over-fitting? perhaps using aikaike or bayesian information criterion, imperfect as they are? @sameersoi: thanks for complement. Intent here is more exploratory analysis than pure statistical inference, and thus preference is given to gaining insight from parsimonious models over model selection considerations (i.e. AIC / BIC). Separately, overfitting is a pervasive concern with ML, worth discussion for this model (e.g. cross-validation is natural in this context), and deliberately not considered in this post for brevity.